Jemma Gunning is a Bristol based printmaker who specialises in etching. 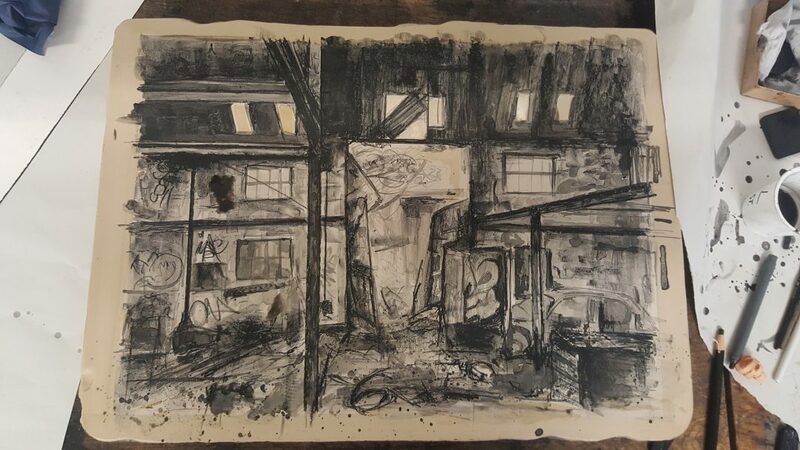 In her work she celebrates the beauty she finds in abandoned buildings (of which there are quite a few in the locality!). 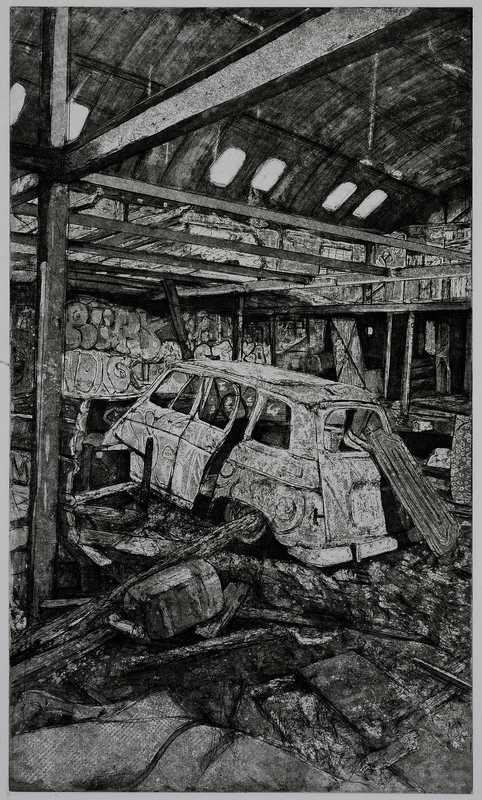 Etching is the perfect medium for Gunning’s visual elegies – the process requires an enforced ‘decay’: she uses acid to bite into her copper etching plates to form the lines of her image; a process that resonates with the natural decay of the structures Jemma Gunning finds her inspiration in. She searches for the lost narratives, imagines the forgotten former inhabitants, and creates highly detailed images of these abandoned interiors and exteriors. Her works ask us to slow down and properly consider subjects that too many of us would normally walk straight past and ignore. 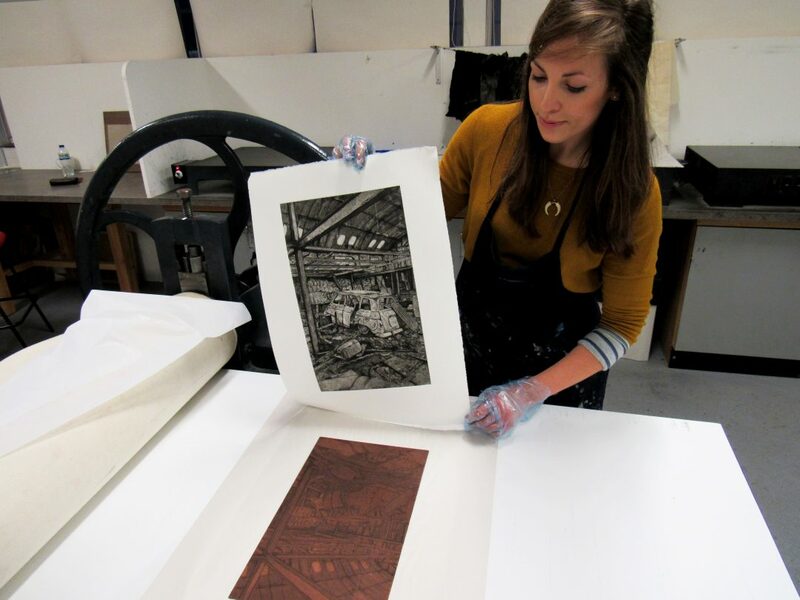 I wanted to find out more about Jemma Gunning’s impressive prints. Lisa: Can you tell us about your latest project depicting abandoned buildings in Bristol? Jemma: I have always found cities fascinating; the surfaces and structures are continuously changing. Since moving to Bristol and living in the heart of a city, I have become drawn to abandoned buildings. A moment of serendipity occurred when I stumbled across a decaying castle-like structure that evoked a feeling of curiosity. I was enchanted by these remnants of the past: the crumbling bricks, the rickety window sockets, rotting façades, the repossession by Mother Nature and the overall fragility of the form. 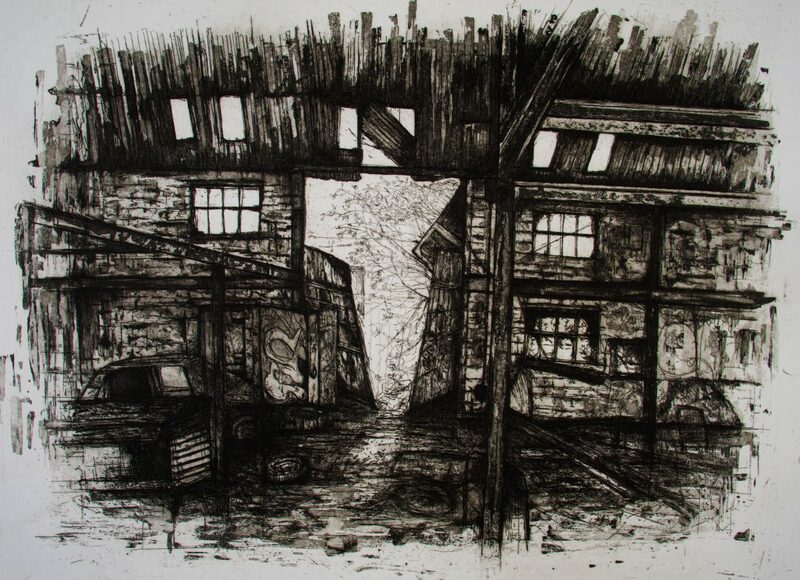 I began to document the New Gaol behind M-shed, creating etchings over the past year, depicting its redevelopment. Carrying out archival research at the Bristol Record Office has sparked an interest in Bristol’s history and the heritage we are losing by site redevelopments. This generated a project whereby I have begun to explore the city in search for further past deserted forms that encompass raw authenticity. My plan eventually is to formulise a map, highlighting the areas containing historic buildings that are soon to be obliterated from the landscape. To date, I have accessed the New Gaol, the old Parcel Force building next to Temple Meads train station and McArthur Warehouse near SS Great Britain. I have begun to record their ephemeral state through various printmaking processes, preserving a moment in time and documenting our heritage. Lisa: Printmaking processes can seem a bit of a minefield to the uninformed! Can you explain what exactly you do to make your prints, including the sugarlift and aquatint? 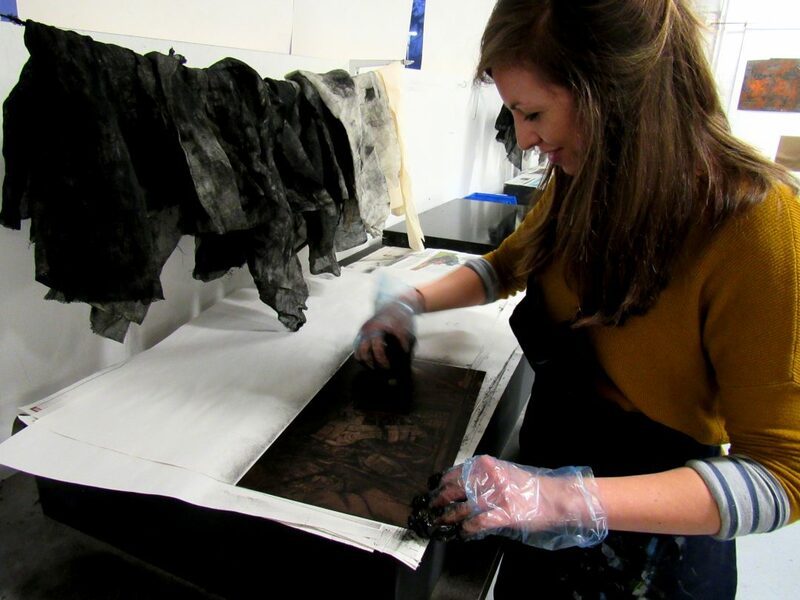 Jemma: I primarily use etching as a process to create my work which belongs to the intaglio printmaking family. 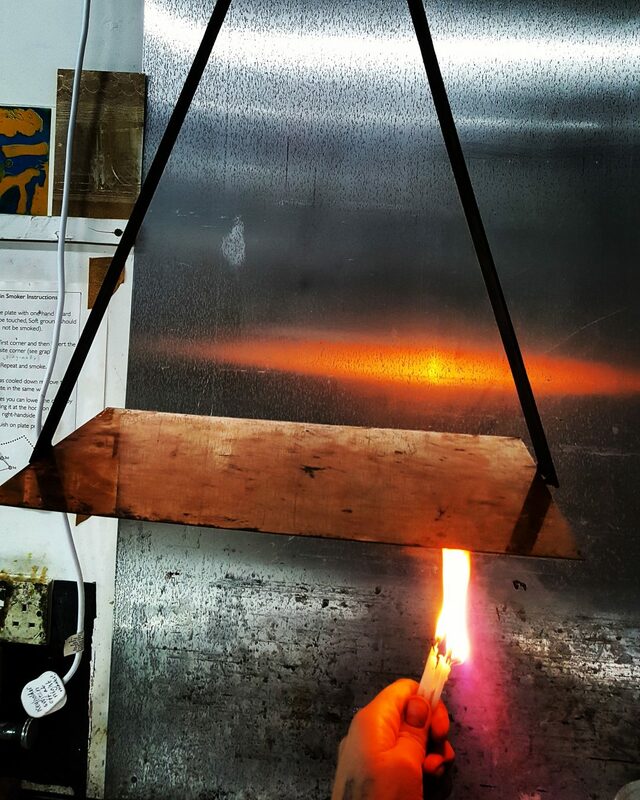 Firstly, I coat a piece of copper with an acid resist material called a ground, typically made from wax. Once applied, I use a sharp tool called an etching needle to draw through the ground to reveal the shiny copper underneath. You do not need to apply much pressure; I just let the needle glide across the surface creating an abundance of varying marks. Once complete, I submerge the copper in ferric chloride. The acid eats away at the exposed metal, creating bitten lines and marks. After the copper has been bitten in acid, a proof is made and further work is carried out. This could be another hard ground or applying tone through sugarlift and aquatint. Each time the plate is placed in the acid I make a proof, ascertaining the next step. The plate continually gets reworked until I achieve the aesthetics I want. Prints are created using an etching press. The pressure pushes the paper into the etched recesses, lifting the ink out of the incised lines and producing a mirrored image. Aquatint creates even tonal ranges across the plate, providing depth and surface texture. The plate is covered with an even covering of fine Rosin (acid resistant resin) that is then fused onto the copper with heat. This provides the surface of the metal with a tooth allowing tonality to be achieved when etched in stages. Sugarlift generates positive painterly marks creating expressive surface characteristics. The process begins by painting a sugar solution on the surface of my etching plate. Once dry, a hard ground is applied and submerged in hot water. Where the sugar solution has been painted, the ground lifts away. Lastly an aquatint is applied to enable tonal marks to be achieved. Using these processes supports my vision in the subjects I am depicting. Textures and marks are important to my practice as it helps express what my eye witnesses in the urban landscape. Lisa: How much room for error is there in making the prints that you make? 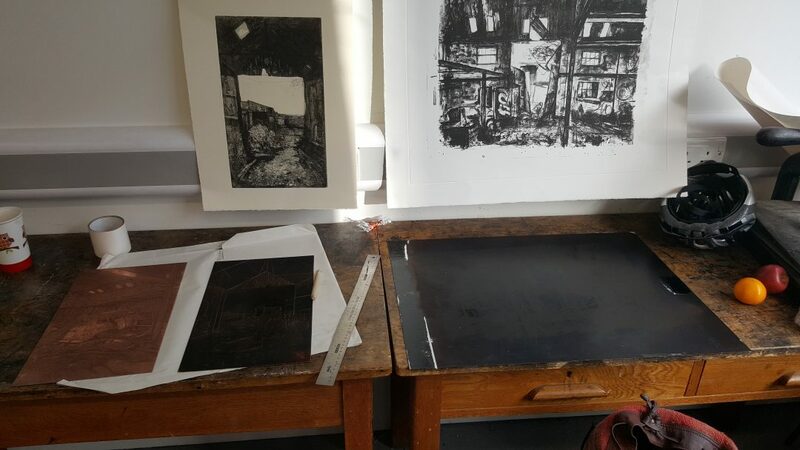 Jemma: For me the slowness of the process allows me to continually reassess, expand ideas and fully enjoy the methodological approach of intaglio printmaking. Etching is something that cannot be rushed, it takes time and commitment. It’s extremely process driven and attentiveness is essential. The crucial part in etching is the acid on the plate. It has to be done with careful consideration and timing. If the plate is left in the acid for too long it could be over etched, creating unwanted dark tones and marks. Concentration is essential! Lisa: What is it about abandoned buildings that you are so drawn to? Jemma: Many opportunities exist within the urban landscape for artistic practices. For me the city is a living museum that contains visuals from the past and the present. Bristol has become the building blocks of my practice, focusing on the often overlooked, the transient and the redevelopments that are happening across the city. When I come across an abandoned building I immediately get an overwhelming feeling of excitement. An adventure begins into the unknown! I am anxious of getting caught, if the building is safe, and what or who are the ruins inhabitants, will I be alone? This tension is juxtaposed with ruin lust, enjoyment, visual stimulation, motivating me to continue exploring the form. More often than not, the inside of an abandoned building contains just as much enchantment as the outer shell. Rusty pipes, peeling paint, neglected machinery, graffiti, and clues of past and current occupants are all entwined with natural forms reclaiming the land. These dishevelled aesthetics provide inspiration to work from. It’s this thrill and apprehension that inspires me and keeps me going back for more. 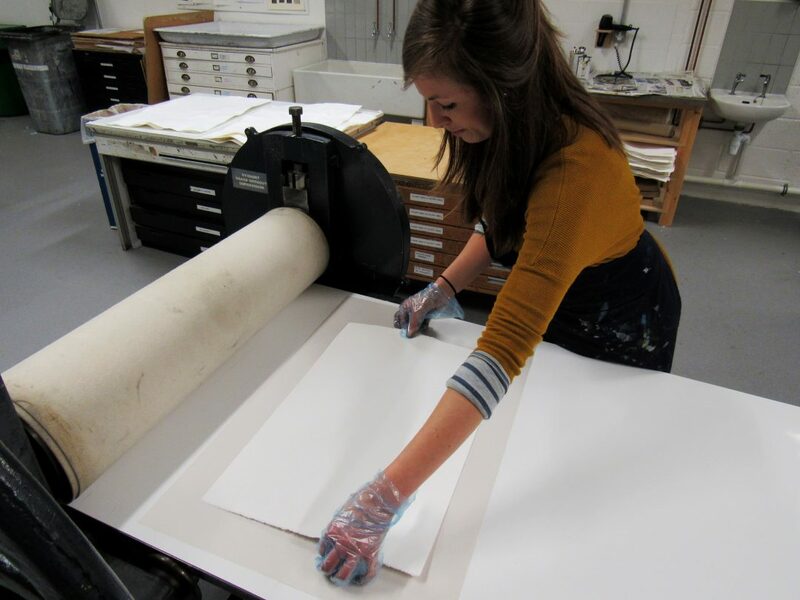 Lisa: Do you think that some subjects are better suited to certain printmaking processes than others? How do you decide what medium you’re going to use to make your work? 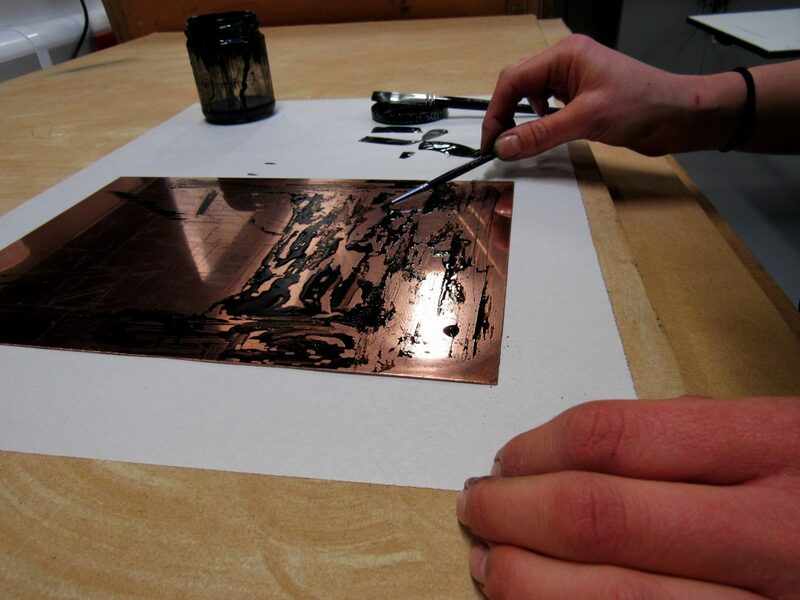 Jemma: There are an abundance of printmaking processes that best suit different practices but I use etching as it is strongly rooted to drawing and the process contains powerful visual expressive values. The rich qualities of the intaglio process reflect the subject matter I am exploring and documenting. Like the city, my work contains layers of information which have taken a beating through the etching process. This links to how we have a presence in the landscape and physically form an impact on surfaces, reflecting the process of acid on copper. Lisa: Do you ever work on several compositions simultaneously? Jemma: I generally work on a few images at once to keep my momentum going. I find I am continually learning and understanding the processes of etching. Working on several compositions allows for each one to develop and be enriched by another. Due to the lengthy processes involved in etching, it is achievable and time effective to work on a few plates at once. Lisa: Do you have favourite inks/paper that you like to work with? Jemma: I tend to use a 50/50 mix of black and sepia ink. I find this provides the etching with rich warm tones. I prefer to use Somerset satin or Hahnemuhle paper 300gsm. I find that these heavy weight papers in particular hold velvety tones and provide strong linear values. Lisa: What print from this series are you most proud of and why? Jemma: McArthur Warehouse is the largest etching I have completed to date. Working on this scale was a huge challenge. It took lots of time and determination to finish the plate using an abundance of techniques and processes. The scale allowed me to work more expressively and intuitively, providing energetic marks and surface texture. I’ve lost count how many times the copper went in and out of the acid but the varying stages have created an illusion of depth, which I am extremely delighted and pleased with. Lisa: What do you plan to work on next? Jemma: I continually have a desire to expand the range of mark making within my work. Most recently I have begun a technical experiment by combining stone lithography and etching. This extends the surface marks and tones that can be achieved, forming a lively, expressive and atmospheric mood within a print. I plan to continue this line of enquiry by responding to new and exciting fragments that I find in the urban environment. Recently I have started to exploring the Elizabeth Shaw’s chocolate factory in Easton. This has provided new stimulating subject matter, motivating and enriching my experiments. Jemma: You can head to my website www.jemmagunning.com or follow me on Instagram (jemma_gunning_printmaker) where you can see my work in progress. 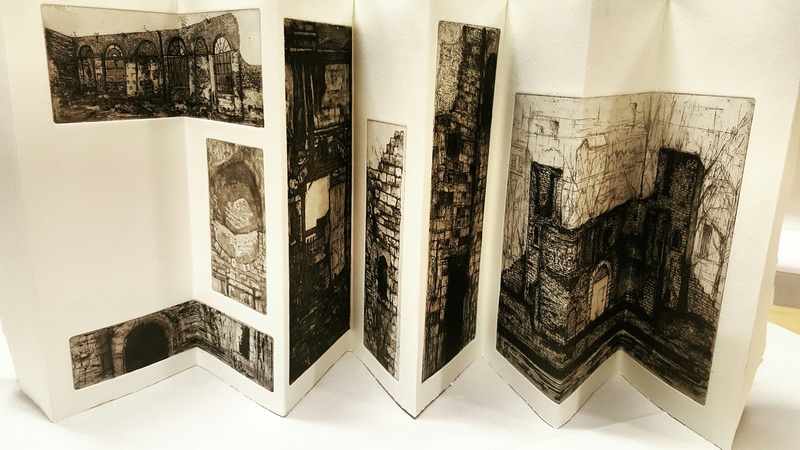 You can see my latest venture of book making at BABE (BristolArtistBookEvent) where I will be exhibiting a concertina book about the New Gaol, along with my etching Wapping wharf. 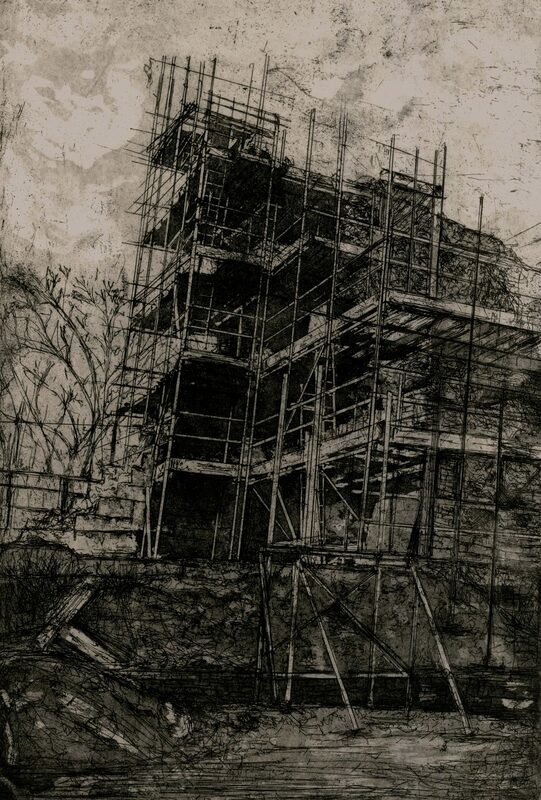 I am a member of Spike Print Studio and will hopefully have my latest etching McArthur Warehouse on show during the Open Studio weekend on the last weekend in April. so interesting in its relation to the buildings that inspire her.